Dog is man's best friend, but it's also an elephant's. Humans aren't the only members of the animal kingdom to have animal companions. Some animals find deep friendship and true, emotional connections with other species, but do animals actually keep other animals as pets? Your regular old cheetah isn't putting a collar with its name and address on a lovable little canine. It's definitely not yelling "Good boy!" when its furry friend retrieves the newspaper, but sometimes the ferocious felines do actually adopt dogs. In fact, zoos encourage it. Cheetahs aren’t alone when it comes to keeping animal pets. Nature has seen some weird animal companionships – from horses who keep goats as seeing eye dogs to tarantulas that keep frogs as house pets. Even gorillas have been witnessed adopting kittens only to mourn their death when they've finally moved on. Just try and say animals don't love their furry friend. You can't. These 10 animals with pets will show you that friendship truly isn't bound by species. It’s hard to tell if tarantulas domesticated tiny microhylid frogs, or if the frogs decided to domesticate themselves. Tarantulas can be vicious killers – the kind of creature that can take down a venomous snake in a single bite – but that sort of changes when they approach these tiny frogs. Scientists suspect that microhylids just don’t taste good because their skin is filled with toxins, so instead, the arachnids decided to keep them around as pets. Microhylid frogs generally eat ants, one of the main predators of spider eggs. Arachnids get protection for their young, like how some humans keep dogs to ward of trespassers, and these pet frogs actually gain something by hanging around giant spiders, too. The small frogs feast off of what’s left of the tarantula’s prey – just like you might feed your dog some scraps from the dinner table. Zoos have started the practice of giving nervous cheetahs an emotional support pet, proving that service dogs aren’t just for people. 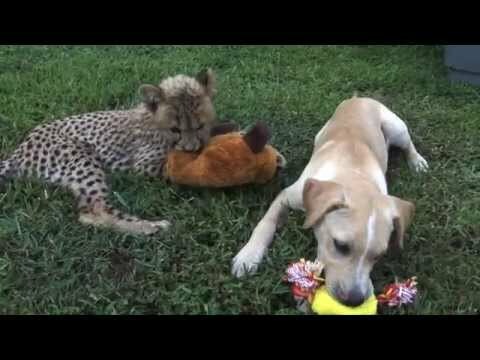 Most recently the Metro Richmond Zoo gave their nervous cheetah cub a pet dog after it was rejected by his family. According to the Metro Richmond Zoo, cheetahs use dogs in the same way many of us do - to protect us, to make us feel safe and give us unyielding love and loyalty. “The dog has a calming influence because the cheetah will take behavioral cues from the dog - learning not to fear his surroundings, but instead embracing them with confidence. The dog normally becomes the dominant figure in the relationship by becoming the protector and leader. The cheetah will not hurt or kill his friend," they said in a statement. It’s not just humans who adore feline companions! 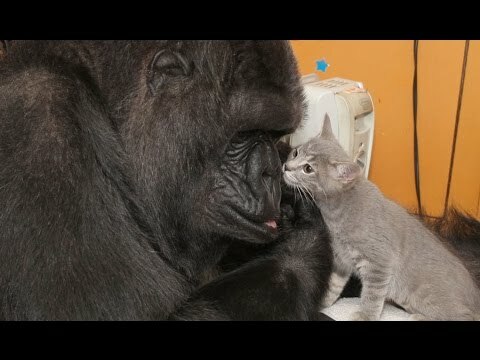 Gorillas, who differ from humans by just 1.6% of DNA, have in certain instances been known to adopt cats. The most famous of these examples is Koko, a western lowland gorilla who learned sign language and adopted a kitten. Koko named the kitten “All Ball” because she thought the cat looked like a little ball. She played with, cared for and loved the tiny creature. In heart-breaking footage, Koko cried over the loss of her pet kitten once she discovered it had died. Koko truly formed an emotional bond with her small cat.